Tag line: "Out Of Her Curtained Past...Came A Man Past All Forgetting!" 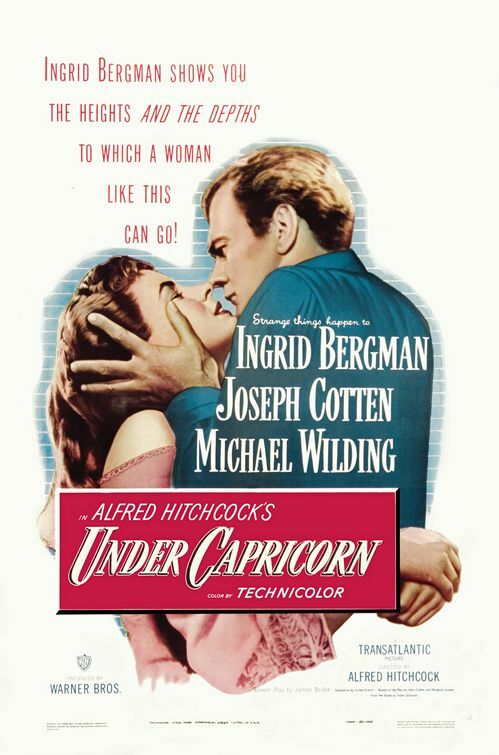 During one of his interview sessions with Francois Truffaut, Alfred Hitchcock was quite critical of his 1949 movie, Under Capricorn, a costume drama set in 19th century Australia that starred Ingrid Bergman and Joseph Cotton (both of whom had worked with the director before: Bergman in Spellbound and Notorious, Cotton in Shadow of a Doubt). Combining romance with intrigue, Under Capricorn was a definite change of pace for the Master of Suspense, which may be why the film was a financial failure. “If I’d been thinking clearly”, Hitch told Truffaut, “I’d never have tackled a costume picture”. Fresh off the boat from Ireland, Charles Adair (Michael Whiting) is looking to start a new life in Sydney, and introduces himself to Sam Flusky (Joseph Cotten), a fellow Irishman and wealthy landowner who, years earlier, was sentenced for the murder of his wife’s brother and promptly shipped off to Australia. As it turns out, Adair had known Flusky’s wife, Henrietta (Ingrid Bergman) when they were both children. Nowadays, the beautiful Henrietta is prone to bouts of madness, brought on by her alcoholism. Adair, who finds he has feelings for the troubled Mrs. Flusky, takes it upon himself to try and help her, only to learn that Henrietta’s inner demons are masking a secret from her past, one that, if revealed, could change her life forever. At times, Under Capricorn is far too talky for its own good, and neither Bergman nor Cotton successfully mastered an Irish accent (to hear Bergman try it is almost comical). Still, Hitchcock may have been a bit rough on the film, which isn’t nearly as bad as he thought. His second picture in color (Rope, released a year earlier, was his first), Under Capricorn is a gorgeous-looking costume drama, with several well-executed long takes (In an uninterrupted sequence, Charles arrives at the Flusky estate to attend a dinner party, and, while standing on the porch, watches as Sam, moving from room to room inside the house, bellows orders to his servants). Add to this an excellent supporting performance by Margaret Leighton as Milly, the Flusky’s cruel, manipulative housekeeper, and you have a movie that, while not one of Hitchcock’s best, is nonetheless an interesting attempt to branch off into another genre. I have never even heard of this film! I had no idea Hitchcock ever directed this sort of movie.